Show how much you care by purchasing a medical ID bracelet for your child. These bracelets are a must for those with medical conditions and can bring peace of mind to any parent once their child slips one on. No parent wants their child to have a life threatening medical condition. For those who have kids with a condition, it can be scary for them to think about not being with their child and having that medical condition go undetected in case of an emergency. Medical ID Bracelets can be a simple way to alert those around your child in case of emergency. These bracelets come in a range of styles for both boys and girls that are not only fashionable but easy to recognize. Conditions such as diabetes, allergies, asthma, and other medical concerns can be listed on most bracelets. With a variety of styles and materials to choose from, children will enjoy wearing fun designs of medical ID bracelets that will not make them embarrassed or self-conscious of their condition. Unlike traditional bracelets that are very visible, those designed for kids are done in trendy styles that look similar to popular jewelry designs. The Medical ID Store has cute medical alert bracelets in a range of styles and prices. 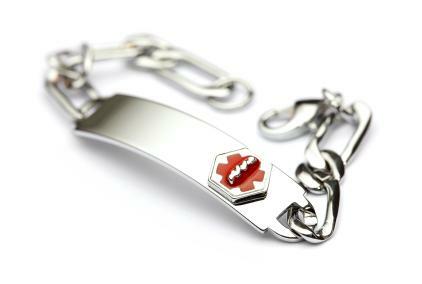 Most bracelets are done with an engraved stainless steel medical alert plate. Engraving is included in the price of the item. Classic Pink Beaded Medical ID Bracelet: This cute bracelet is perfect for girls of all ages. It is done in a beaded style that features pink cat's eye beads, light yellow Swarovski crystals and a FIMO flower in the center. Sterling Silver Hearts Pink Rubber Medical ID Bracelet: This bracelet is fun to wear and fits into the latest fashion trends. It can be layered with other rubber bracelets or worn alone. Done in bubble gum pink rubber with a stainless steel plate and sterling silver clasps, this bracelet will be a hit with any girl who receives it. Another choice to consider for both boys and girls is the Child's Stainless Steel Medical ID Alert Bracelet. Crafted in stainless steel, this bracelet is done in a classic style that will suit children of any age. Sticky Jewelry carries a large selection of medical ID bracelets as well as pendants and charms designed just for children. Most designs are crafted from hypo-allergenic stainless steel and are able to be laser engraved. With each purchase, a free medical alert wallet card is available. Leather and Hemp Medical Alert Bracelet: This adjustable bracelet is done in tan leather and hemp and can be worn by kids of all ages. Sport Strap Medical ID Bracelet: Done with your choice of nylon strap and stainless steel plate, this bracelet has endless possibilities. Straps are interchangeable and come in a variety of designs such as soccer balls, butterflies, trucks, hearts, bugs and footballs. Sticky Jewelry items can be purchased on the website as well as at locations such as pharmacies and specialty retailers. For those not interested in shopping online, consider local options for finding medical ID bracelets. Many pharmacies carry a selection of items as well as local pediatrician offices, nonprofit organizations and hospital foundations. If you spot a bracelet on a child, ask the child's parent where it was purchased from. If your child has been recently diagnosed with a medical condition, you may be given a list of resources to contact for more information and that can direct you to finding medical jewelry for your child.